Buying Tires Guide: What Do the Tire Numbers Mean? /Buying tires /General information /Buying Tires Guide: What Do the Tire Numbers Mean? 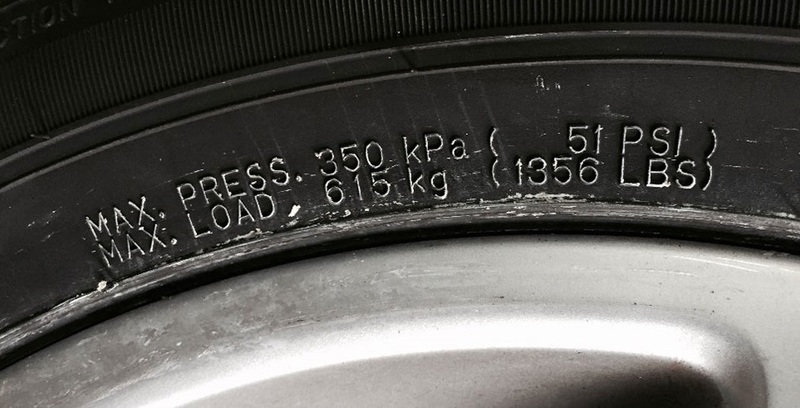 Tire numbers and letters on a sidewall contain information about the tire’s size, maximum speed and load, age, treadwear capacity, and much more. You can learn all these details from three main codes: size code, Department of Transportation (DOT) code, and Uniform Tire Quality Grading (UTQG). There are also additional symbols that represent special features and capacities of the tire. Service description (load index, speed rating). P – the tire is for P-metric passenger vehicles (regular cars, SUVs, light duty pickups of ¼-½ ton load capacities). No letter – a metric-sized tire (in the US, mostly for SUVs and vans). LT – the tire is for light trucks (some SUVs, medium and heavy duty pickups of ¾-1 ton load capacities). ST – the tire is a special trailer tire used on utility, car, and boat trailers. T – the tire is temporary (spare). These are the tires that can be used until the repair or replacement of the main tire is done. C – in Euro-metric sizes, this means the tire is commercial, for delivery vans and trucks. The letter is usually at the end of the size description, along with the load range (B, C, or D). M – the tire is for motorcycles. NOTE: LT can also stand as a suffix of the code, meaning a tire is for heavy-load vehicles (wide base and flotation tires). Tire width/section width/cross section are the first three tire numbers of the code, in millimeters. The measurement shows the distance from the widest spot of the inner sidewall to the same of the outer sidewall. Tire width can vary depending on the rim, so tire engineers mount the items on specified rims while calculating. You can convert the number into inches if you divide the given number by 25.4, or use a calculator. For example, the width of 205 millimeters will be roughly 8 inches. 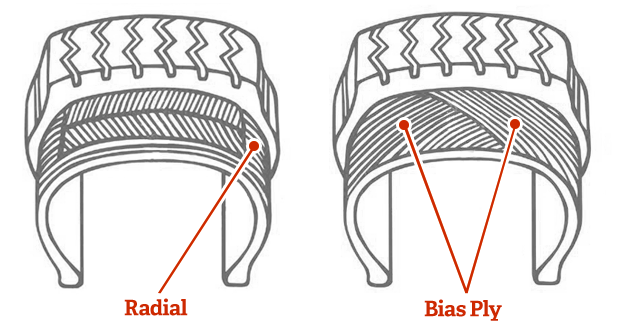 Aspect ratio/tire profile/series is the relation of the tire’s width and height in percent. 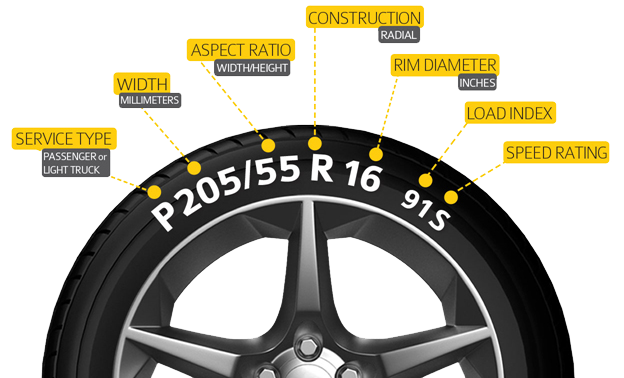 So, 55 profile is 55% of the width, meaning the tire’s height is (taking the width of 205 mm) 112.75 mm or 4.4”. You may see tires without these tire numbers, meaning the tire’s profile is standard – 82%. Also, there are rarely tires with the ratio of three digits, which means it’s in millimeters. If a tire has an aspect ratio of 55 or less, it’s a low-profile tire, usually used for sport vehicles. Such tires provide better grip and performance, but they wear faster. You can learn more about low-profile tire use from this article. R – radial construction. The most modern type with the plies going radially to the circumference, under the proper angle. Such tires are also reinforced with steel belts. More than 98% of tires on the market are this type. “-“ or D – bias-ply (diagonal) construction. The oldest used type with the plies crisscrossing diagonally. B – bias-belt construction. This type is just like bias-ply, with an extra belt over them reinforcing the tire. NOTE: Some tires, mostly those imported from Europe, also use the letter “F” after “R” in their codes. This means the tire has self-supporting run-flat construction adopted by the European Tyre and Rim Technical Organization (ETRTO). The following tire numbers represent rim/wheel diameter (measured from one side to another). The two-digit number is in inches and the most regular sizes are the following: 8”, 10”, 12”, 13”, 14”, 15”, 17”, 18”, 19”, 20”, 22”, 23”, 24”, 26”, 28”. You can see such tires on most passenger vehicles. There are also tires with irregular rim diameters that are often used for box vans, heavy-duty light trucks and trailers. The tire numbers include: 14.5”, 14.5”, 16.5”, 16.5”, 19.5”. Such tires are for specific use and not to be mixed with regular tires. Additionally, some tires use rim diameters in millimeters, but these are rare. Michelin PAX run-flat tires, which are limited Original Equipment (OE) tires in the US, use this system. Service description includes two tire numbers or/and letters: load index and speed rating. Since 1991, authorities require this data for all tires that have a speed rating (Z-rates are an exception). Load index represents the maximum mass a properly inflated tire can hold. Passenger tires usually have a load index between 75 and 105. NOTE: Remember, these tire numbers show you how much you can load on one tire. So, if you want to learn the load capacity of the whole set, multiply the mass by 4. So, according to the table, 91 index means 1,356 pounds per tire, or 5,424 per set. Speed rating shows the maximum speed at which your tire can dissipate heat. It’s usually one or two letters, or a letter and a number. If the tire speed capabilities exceed the maximum limit (Y – 186 mph), the load index and “Y” have to be in parenthesis. NOTE: The tires with speed capabilities over 149 mph (W, Y, (Y)) may also have a “Z” before R (radial tire). Tires with over 186 mph capabilities must include the speed indicator Z before R.
P-metric tire sizing is American-invented and can be distinguished by the “P” in front of the actual size data. The system was adopted in the 70s for vehicles that usually carry passengers. Aside from regular cars, these include SUVs, light-duty pickups, and station wagons. Engineers calculate tire load capacity according to a formula that includes the item’s size and the air pressure within it. As a result, vehicle manufacturers can construct new vehicles to fit the formula-based tires. This system is the Tire and Rim Association (T&RA) standard. Also called Euro-metric, this tire number system starts with the section width (225) in millimeters, without any preceding letters. Such a method of reflecting tire width was adopted in Europe in the 60s, later becoming the US standard too. But, the new tire sizes did not appear according to the engineering formula, as in America. Engineers took load and dimensional demands of the vehicles that needed new tire sizes as the base. That’s why metric and P-metric systems slightly differ in load and inflation standards. This system is the ETRTO standard. NOTE: As both systems have the same sizes and dimensions, you can interchange them in axle pairs or sets. Metric-sized tire numbers include greater load capacities, so if you change P-metric to metric, there is no problem. However, if you change vice versa, make sure to buy P-metric tires with greater load capacity. Sometimes, pressure adjustments can solve the problem, but it may also sacrifice the handling and performance of the vehicle. Sport, touring bikes, or cruisers usually use metric-sized tires. When there is no speed rating, “M” stands before the section width. Many touring motorcycles use this system, which is more limited in sizes. If there is no internal design sign after the speed rating, it means the tire is bias-ply. Sometimes, it can also mean bias-belted design. Department of Transportation (DOT) code must be on all tires to be legal for selling and usage in the US. These are the requirements of Federal law. The code is mostly for manufacturers, as it’s more convenient to recall tires using them. However, cautious drivers can also learn a lot from it. Every legal tire plant in the world should have a two- or three-digit, two- or three-letter or a letter-number code. You can find these tire numbers and letters in the Tire Safety Group sorted list. This may be important for those who want to know whether the tire was made in the US. Please note, some of the facilities in the list may have been closed. There is no interpretation of size codes by the National Highway Traffic Safety Administration (NHTSA). However, the Rubber Manufacturers Association has a suggested code deciphering list. Some of the data may be not accurate, as this is an estimate, and some foreign-based manufacturers may use another system. The next 3-4 tire numbers are an optional code for the manufacturer. The code should include the category of the tire, its construction, and tread pattern. Tire companies use this to recall defective tires. By the way, you can check whether your tire company has recalled your tire model here. The last 4 digits of TIN are the week and the year of the tire manufacture. So, the code 4313 means the tire was made during the 43th week of 2013. The newer the tire you buy, the better it is, as rubber deteriorates even if the tire was never mounted. Tire manufacturers recommend replacing tires after they turn 6-10 years old. You can learn more about the code from this post. NOTE: According to the US Government Publishing Office, all tire plants will get new three-symbol codes they have to start using until April 13, 2025. Tire numbers after the word TREADWEAR estimate how much longer the given tire will last in comparison to the reference tire. The latter has the rating of 100, and all other tires that go for a test get ratings in relation. So, if a tire has a rating of 300, it may last 3 times longer than the reference. There are tires with lower ratings like 80, meaning they are sport tires. Their rubber compounds are softer and provide better grip at higher speeds, but they wear faster. The rating can go up to 650-700 and even higher for harder tires that wear longer yet provide rougher ride. The test itself is a 400-mile test loop that a vehicle convoy runs (with both test tire and Course Monitoring Tire (CMT) mounted) for 7,200 miles. Every 800 miles, specialists should check inflation rates and rotate the tires if necessary. The test tire’s tread and the CMT tread are measured during and at the end of the test, and the test item gets its tire numbers. One or two letters after the respective word show how well the tire provides traction on wet surfaces. There are AA, A, B, and C ratings, with the best AA and the worst (relatively) C. It doesn’t evaluate hydroplaning resistance or braking, though. Vehicle sensors measure the coefficient of friction on wet asphalt and concrete. Eventually, AA stands for over 0.54 g on asphalt and 0.41 g on concrete, A – over 0.47 g and 0.35 g, B – over 0.38 g and 0.26 g, and C – less than 0.38 g and 0.26 g.
The test for the traction rating involves dragging the vehicle at 40 mph on a wet surface. A letter after the respective word indicates the limit of temperature that the tire can safely dissipate. There are A, B, and C ratings, where A is the best, and C is relatively the worst. The A grade means the tire can withstand speeds over 115 mph. The B grade shows the tire withstands speeds between 100 and 115 mph. The C grade means the tire is still safe at speeds between 85 and 100 mph. UTQG is one tire number system that is mandatory for most passenger cars in the US. Light-truck, winter, spare, trailer, and those with the rim diameter of less than 12”, don’t require the ratings. The problem with this system is that manufacturers test their tires under controlled conditions. So, the effectiveness of the tire under irregular, or even simple street conditions, may be unexpected. The rule of thumb is that A and AA are the best, and the higher the treadwear rating is, the better. However, you should also choose tires depending on your needs, including the comfort of ride and grip. Aside from the codes, you can also find deciphered data on the number of plies and their materials. 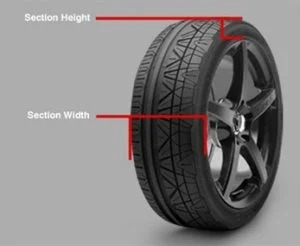 The tread and sidewall may consist of different layers, so the information may be useful if you want a particular tire. The data doesn’t show rubber compounds, only the main materials of the plies. These may be steel, fiberglass, rayon, polyester, etc. Maximum inflation shows how much cold pressure a tire needs, to hold the maximum load. Maximum load shows how much weight a cold tire with proper maximum inflation can carry. These tire numbers are not the recommended inflation and load. So, when mounting and inflating tires, make sure your main guide is your vehicle’s owner’s manual. The information is also on the tire placard in the vehicle. Also note that exceeding the maximum air pressure and load endangers you and the car dramatically. The Original Equipment tire is the one that the vehicle’s manufacturer recommends for a particular car. They partner with tire companies to create tires that act most adequately for certain car models. A star for BMW and Mini. MO, MO1, or MOE for Mercedes. N and a number for Porsche. Tire Performance Criteria Specification (TPS Spec) code for General Motors. BMW M for BMW M line (M3, Z4M, etc.). RO1 for Audi Quattro GmbH cars (RS4, RS6, etc.). G1 for different car companies. M+S/M&S for Mud and Snow or all-season tires. M+T/M&T for Mud and Terrain. These tires provide better traction and self-cleaning in mud, rocks, deeper snow, etc. 3PMSF for 3 Peak Mountain Snowflake symbol that means this is a winter tire. BSW/WSW for Black or While Sidewall. TL/TT for Tubeless or Tube-Type tire. SFI/SFO for asymmetric tires: with Side Facing Inwards or Outwards. LL/SL/XL for light, standard, and extra loads. RFT for Run-Flat Tire for vehicles that don’t use spare tires. Tire codes are the easiest way to learn about the basic things you should consider when choosing a tire. The choice is much faster if you know the recommended specifications for your car and know how to read tire codes. The right size of the tire will hold up to the rim perfectly and won’t get damaged while you mount it. The right speed rating and load index will enhance the best features of your vehicle. The age of the tire will tell you how much time you will be able to ride it. Most tire numbers you see on the sidewall are crucial for your choice.